The tree is up.Gifts are wrapped. It’s also that time of the year when we avoid our textbooks and dodge anything that looks like work. But there’s a way to enjoy the festivities and still develop your Spanish skills. There’s a solution to maintaining your Spanish development, and best of all, it’s a fun one! Listening to Spanish Christmas carols, or villancicos as they’re called in Spanish-speaking countries, will have you rockin’ around the Christmas tree in no time. Pronunciation. Listening to music and song lyrics allows you to hear syllable stresses, rolled r’s, silent letters and patterns in accents—which will assist you in developing your Spanish listening skills. Once the song is familiar, you can begin to mimic the pronunciation, ensuring that you say each syllable or stress the accent just like the voice you’re hearing. Entertaining. Let’s be honest, it’s much more fun to listen to a song on repeat while dancing around the house and singing along than it is to repetitively listen to someone talking about the weather. And when you do get bored of that one annoying Christmas song, simply hit next and you’ll be dancing your socks off to a new tune in no time! Cultural references. Music exposes us to the cultural details of specific countries. Whether the melody is a bolero, salsa or tango, or the instruments are charangos (Peruvian guitar) or vihuelas (Mexican guitar), music can teach us about historical influences and a country’s culture. The lyrics may also tell us about a country’s religious beliefs, Christmas traditions or what makes the season important to the people of that specific Spanish-speaking country. Spanish sentence structure. When you listen to music, you hear full sentences—cries of passion or anguish—which use many different verb tenses. Pay attention to the repetitive structures, and you’ll soon be able to use them to form full sentences of your own. Vocabulary. Listening to Christmas carols will allow you to discover a whole new world of useful holiday vocab, which you likely wouldn’t have learned otherwise. Pick any song and you’ll add expressive, descriptive words to your Spanish word lists! Portable. The great thing about music is that you can listen to it anywhere. Time is a commodity these days, whether you work, study, socialize, raise children, volunteer, etc. Especially around the holidays, every minute of our days can easily be filled. Listening to Christmas carols on-the-go means you can improve our Spanish skills at the gym, during your commute, while walking, at work or even while you cook. 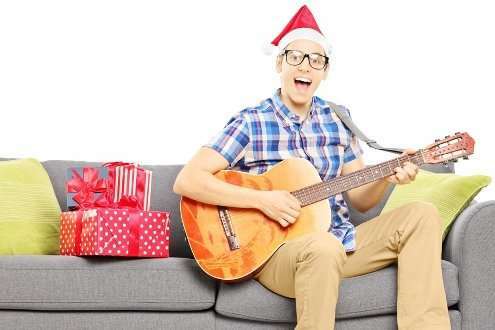 While Christmas carols make for lovely background music to set the mood over the holidays, you can take it several steps further by using these strategies to learn Spanish from these carols. Have a purpose. Before you listen to a song, decide what your focus will be. Will you try to translate? Improve your pronunciation? Look for uses of the present tense? Whatever you choose, just pick one. This will stop you from feeling overwhelmed by trying to figure it all out at once. Dissect the grammar. During each song, pause and ask yourself what tense is being used and why. Go one step further and write down a list of ten verbs used in the song, and then conjugate each into the past, present and subjunctive tense. Feel it. After you listen to a song, write down a list of the emotions the music evoked in you, then identify specific lines in the lyrics that brought about those feelings. Are there other words you could use to describe those same sentiments? This will help to expand your vocabulary, while practicing expressing how you’re feeling. Write the lyrics. Listen to the song a few times, then try to write down the lyrics. Depending on your level, you could do this just for the chorus, or a single verse. When you’re done, compare your lyrics to the actual ones. You’ll be surprised at how much you know and learn when you take the time to pause, listen and act. Said to have originated by African slaves in Colombia during the Spanish colonization of the country, Cumbia is a vastly popular musical style enjoyed across Latin America. Listening to “Cumbia de Navidad” will teach you about the deep-rooted cultural history of the continent, as the small dance steps started because the feet of the slaves were shackled so they couldn’t move or do intricate dance steps. This famous and widely sang Spanish version of “Jingle Bells” is great for singing along and comparing lyrics. From the opening line “Ha llegado Navidad” (Christmas has come), you’ll notice it’s different from the English version’s “Jingle bells, Jingle bells, Jingle all the way,” thereby allowing you to compare and contrast the lyrics for a valuable lesson about translation. Finding it difficult to roll the infamous Spanish r? “El Tamborilero” is not only fun to sing along with, but the Spanish version of “The Little Drummer Boy” will also help you to focus and develop your trilled, rolled r‘s in an entertaining way when you reach the “Rum-pa-pum-pum” lyrics. Pop this track on, lose your inhibitions and you’ll soon be confident enough to roll your r‘s naturally in everyday conversation. Also known as “El Burrito de Belén” (The donkey of Bethlehem), this Venezuelan Christmas song is sang in classrooms across Latin America, and was even covered by the famous Spanish singer Juanes. For added Spanish learning, why not write out the Christmas nativity story, as the lyrics of this song tell the tale of a donkey who is journeying to Bethlehem on the night Jesus was born. This popular party song sings a different kind of salsa. Unlike the usual sensual, provocative salsa lyrics, “La Fiesta de Pilito Navidad” encourages the indulgence of Christmas festivities such as eating cake, pork, rice and rum. Played at parties across Latin America, families and friends take to the dance floor as a group rather than couples. This song will have you salsa dancing across your kitchen when cooking Christmas dinner, or around the tree when decorating. Its fun rhythms are impossible to deny, as the lyrics encourage listeners to forget their problems during the holidays and just enjoy being with their family. Similar to “Cascabel”/”Jingle Bells,” “Paseo en Trineo” is a great song for Spanish to English lyric translations and comparisons. Starting with the first line, “Ponte la gorra, guantes y abrigo…ya va a nevar” (Put on your hat, gloves and coat…it’s going to snow) is clearly different from the English version’s opening line, “Just hear those sleigh bells jingling, ring, ting, tingling too.” This fun, joyful song is always a winner for getting into the Christmas spirit. Considered one of the best Latin American singers in the world, Puerto Rican Luis Miguel will have you swooning and waltzing around your living room with his Spanish version of “White Christmas.” This is a great song for relaxing, while listening to the velvet voice of Luis. For added Spanish learning, try to count the number of times he uses a word to describe snow, write it down, then add your own descriptive words to the list. Unlike “La Fiesta de Pilito Navidad,” Marc Anthony’s salsa song “Me voy a regalar” carries the pining, romantic lyrics of a relationship’s breakup, and the promise to find true love this Christmas rather than excitedly partying the season away. This is a great song for translating to English, as it includes many verbs useful to Spanish learners. To make the most of this song, use one of your listens to write down each verb. Then, see if you can write the past, present and future tenses of every verb on your list! This Christmas, may your home be filled with the festive notes of Spanish Christmas carols, aromas of delicious feasts and merriment of the holiday season. ¡Feliz Navidad! If you liked this post, something tells me that you’ll love Perfect Sunset School,the best way to learn Spanish with real local people! And please remember….if you like it share it!